I really couldn’t stick to just one “theme” to post, they’re all too beautiful not to share. You can find her here on Facebook and Instagram. So anyway, the knit stitch AKA waist coat stitch AKA what ever you want to call it has been really popular, and I kept swooning over how much it resembled knit! And when I saw that a heart pattern could be created from this stitch, I knew I needed to make something with it. If you haven’t seen or tried this stitch yet, I advise you do. It’s super easy! Oh, and the color possibilities! 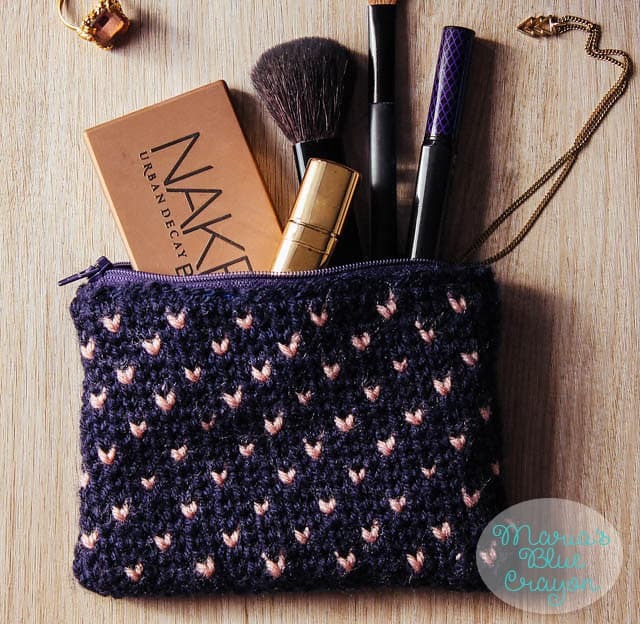 Since this was a very basic stitch, I wanted to mix it with other media to really give the item depth so I decided on making a small pouch complete with lining and a zipper on top for closure. Nobody can have enough bags. I put bags IN my bags. Like since I carry multiple chapsticks with me, I like to keep them all in one place. Ya know what I mean? 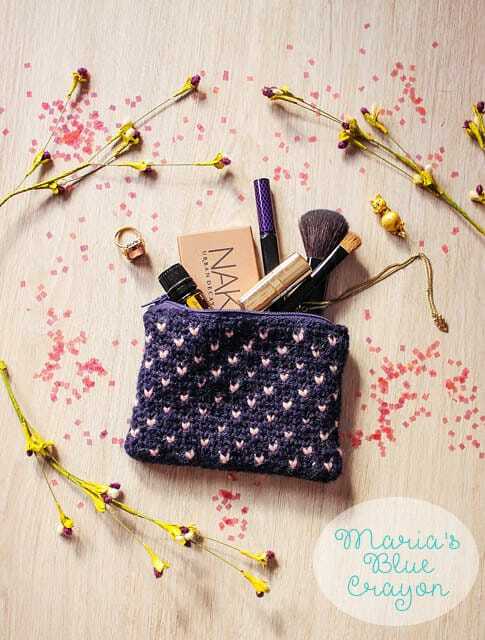 Small sized pouches where you can store your small items to keep them neat and tidy always come in handy. 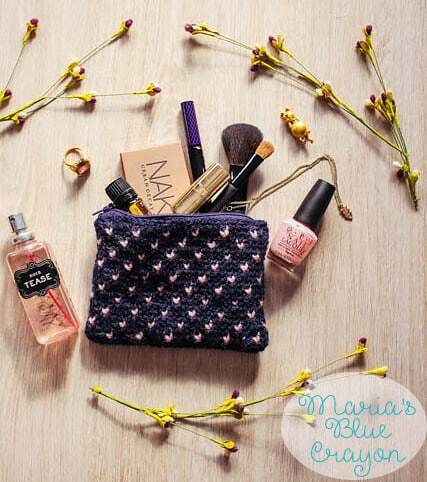 The pouch measures about 6 inches in width and 4.5 inches in height. 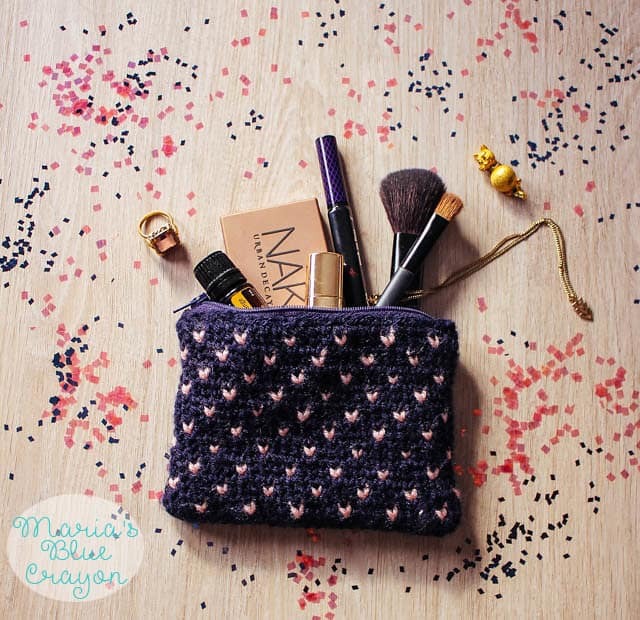 It’s perfect for make-up, craft items/notions (think: buttons, needles, safety eyes, stitch markers, pins, etc. ), small office supplies, small planning accessories, change/small bills, nail polish, jewelry, crayons and a small notepad(for your kids), bandaids/sanitizer/OTC meds for your purse, ANYTHING! I’m sure you can think of at least a few other items to store in a small pouch that can go with you anywhere. Like I said, I’m a fan of small pouches. I use them for everything. So now that you feel the need to make ALL the small pouches, here’s the run down.. This pattern will be worked in rounds. When finished, it will be sewn to close up the bottom. A stitch marker is recommended, but is optional. I found it easier to use a stitch marker to keep my rows uniform/ensure the same number of stitches per row. I did not carry my yarn when changing colors, I simply let go and picked up the color I needed as I went. You may choose to do either. Repeat rows 3-6 until height of pouch is 4.5” or to desired height. Taking the main color and a tapestry needle, sew the bottom of the pouch shut. **If this is your first time sewing in a liner/zipper I suggest you watch this youtube video. The pouch measures about 6”, to keep it safe I used a 7” zipper. For fabric, I used 100% cotton fabric found at Joann’s. Measure the height and width of your finished pouch. Lay fabric down on a flat surface. Measure out the width of the pouch and double the height – adding about an inch to the height and width to allow room for sewing. Example: My pouch turned out to be 4.5” in height and 6” in width. My piece of fabric I measured out was 10” in height and 13” in width. Fold the fabric in half so the design part is on the inside. Sew up both sides by hand or sewing machine. Fold down the top outer edge about half an inch and sew around. Take your zipper and unzip it. Place it on the top of the inside of the bag and start to pin it in place. Once you have your zipper sewed on, take your lining and place it inside the bag. Sew the lining onto the zipper. **I hand sewed the lining and zipper onto the crocheted item and used a sewing machine only for the forming of the lining. TIP: If you would like a larger pouch, simply chain in multiples of 4 +1, add as many rows as needed. I would love it if you share your finished projects with me! Feel free to tag me on instagram @mariasbluecrayon, leave a comment below, or show me on Facebook! This is so pretty! Thanks for the free pattern! This is very pretty and I'm sure all my grandaughters will love it. Only thing is that I carried the yarn along with me and the second color does show thru the sc stitches in tiny dots. Is that normal or am I doing something wrong. And also if you don't carry the yarn along doesn't it live loose strings of yarn between the ^'s? oh I didn't read far enough so didn't see you used a lining. The loose threads, if any, would be covered by the lining. So I'm going to line next time I make one.